Home World Affairs Six killed in explosion at chemical plant explosion in China. Six killed in explosion at chemical plant explosion in China. 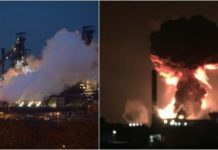 In China, a huge explosion rocked a chemical plant at Yancheng in Jiangsu province today, killing at least six people and injuring dozens. Officials and state media said, the blast knocked down factory buildings and sent a huge plume of smoke skyward. Around the time of the explosion, China’s earthquake administration reported a 2.2-magnitude tremor in Lianyungang, a city near the Yancheng blast. Footage from state broadcaster CCTV showed windows of nearby houses blown out from the force of the explosion. Officials said, on-site rescue is still going on. They said, cause of the accident is under investigation.